Knitwear is stretchy. Lay down a pullover on a flat surface. Measure the sleeve length from the tip of the shoulder to the hem of the sleeve. 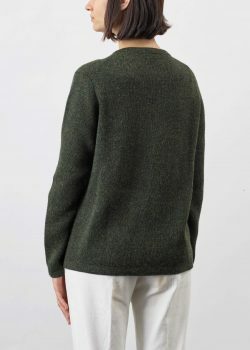 The length and width measurements are taken from the highest and widest points of a flat lying pullover. Slight deviations are rare but possible due to production tolerances. Alpacas are native to the high Andes Mountains of South America. Treasured by ancient civilisations, their fine fleeces were originally reserved for Incan royalty. In 1920 the two-thousand-year-old Paracas textiles, which are partially made of the sustainable Fibre of the Gods, alpaca, were found in a very good condition at a necropolis in Peru. The valuable alpaca fleece is shorn much like sheep wool, annually and in spring. Alpacas are much happier in warm weather once the fibre is removed and by the time cold weather returns the sustainable fibre regrows. Alpaca naturally regrows every year and is classified as a very durable and therefore a highly sustainable and long-lasting fibre. With proper care, alpaca is virtually indestructible and can be worn for years, reducing the unhealthy demand for new products. 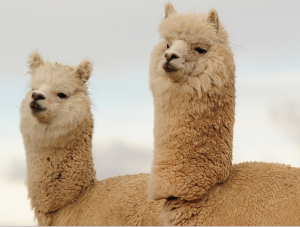 Because alpaca is naturally free of lanolin and other oils found in sheep’s wool, no harsh chemicals are needed to process alpaca fibre, making alpaca ranching 100% natural and safe for the environment. 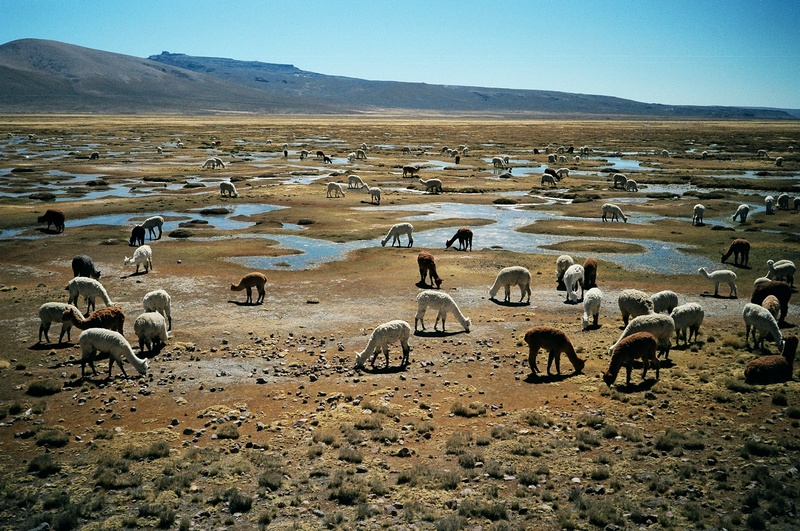 The alpacas adaptation for living in harsh environments, such as the Andes mountains, grants them a light eco-footprint. When compared to other grazing animals, alpaca’s soft feet leave terrain undamaged and their low-nutrition eating habits result in minimal water and acreage consumption. The close-to windproof alpaca fibre is naturally water- and perspiration-repellent and functions as a thermal insulator, while resisting solar radiation effectively. These characteristics guarantee a permanent and appropriate coat, protecting the alpacas against extreme temperature changes. The same protection is offered to humans and is therefore ideal as sportswear or for outdoor activities. 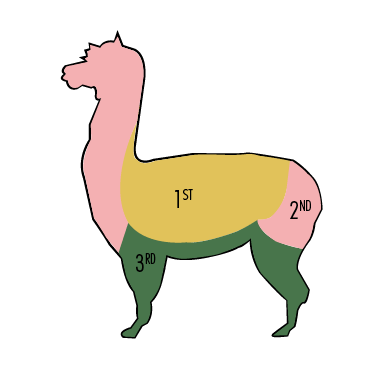 Alpaca is more resistant to pilling, wrinkling, felting, shrinking and ignition, than other natural fibres. Alpaca fibre is hypoallergenic – it does not contain lanolin, which holds dust and microscopic allergens that often create allergies associated to wool. Most people who have wool based allergies will not be allergic to the smooth and itch-free alpaca fibre. Baby alpaca is a soft, smooth, silky and durable natural fibre, that is not itchy or prickly on the skin, whereas the wool from an older alpaca is slightly more sturdy. Alpaca wool can be described as cashmere-soft, with the strength of modern synthetics and as much more robust than sheep wool. 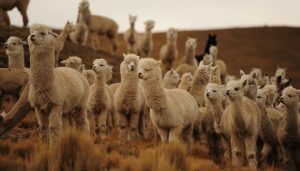 The term baby alpaca describes the young alpaca’s first shorn fleece as well as the fine downy undercoat of the alpaca. Therefore baby alpaca is not shorn from small baby alpacas. 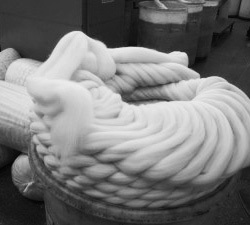 The fibre has a fibre diameter of 22 or fewer microns. Baby alpaca therefore belongs to the rarest and finest classification of alpaca wool. 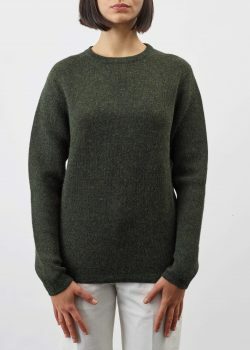 Strong alpaca is the classification for medium fine alpaca fibre with a fibre diameter of less than 36 microns. 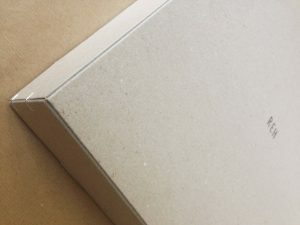 Its haptic is smooth, soft and slightly sturdier than baby alpaca. 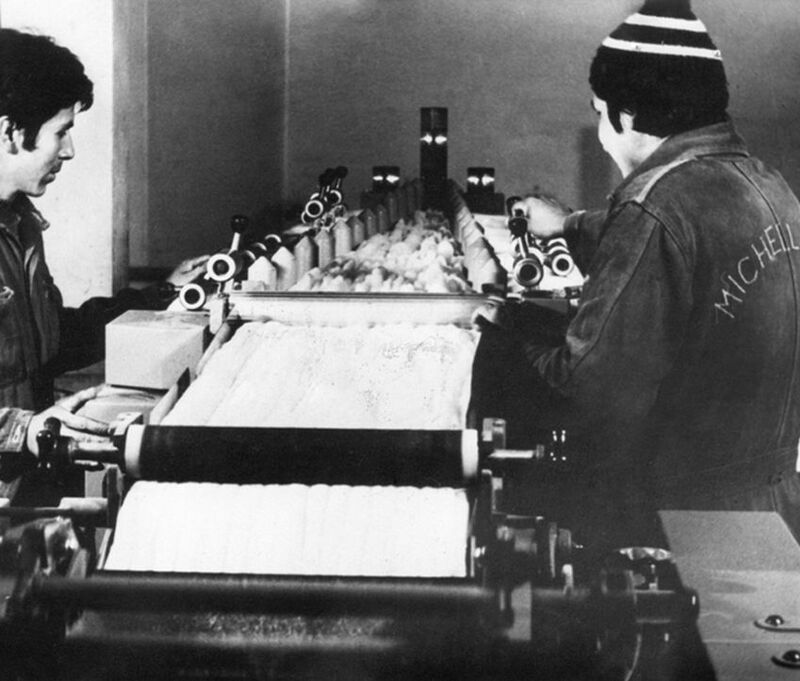 The high-quality alpaca fibre stems from Michell – a company founded by Frank W. Michell in Arequipa in 1931. Today, Michell is known for its highly refined fibre finishing processes and the sustainable production of one of the finest Peruvian alpaca yarns. Michell sources the raw alpaca fibre from small communities in Peru, that sustain traditional alpaca herding. 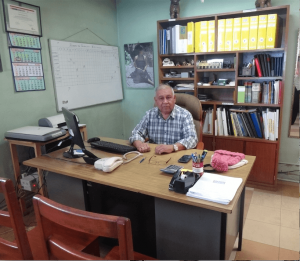 With some of the wool sales, Michell funds his own non-profit organisation called Mirasol – a school and shelter for children, who face a dangerous walk of 3 to 4 hours to get to school. 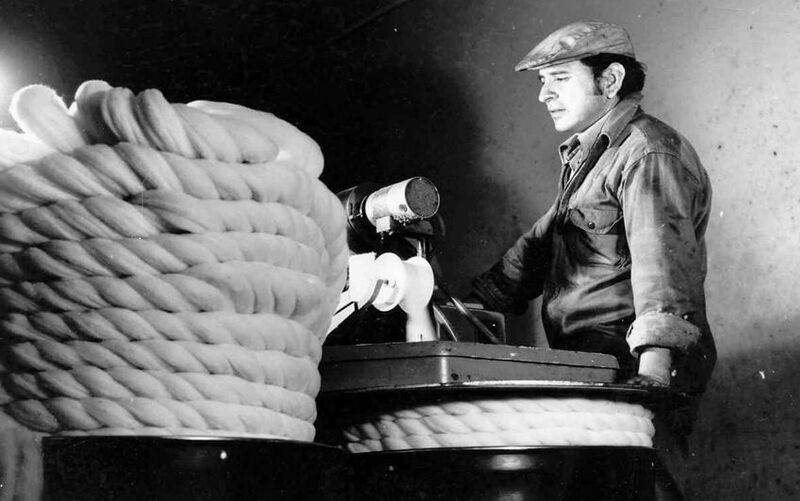 In the light of the constant comings and goings of knitwear manufacturers in Peru, Mr. Muñoz founded one of the oldest knitwear manufacturing companies in Arequipa in 1991. 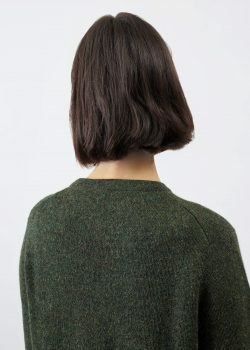 Today, Mr. Muñoz and Mrs. Muñoz are fully specialised in high-quality baby alpaca knitwear and run a team of 20 employees. 5€ will be donated to the non-profit association La Escuelita e.V. The gross price solely includes a donation of 2,50 € by the customer. The other half is deducted from R.EH`s own profit per sold R.EH item.